A student of Constantine Celani and Giuseppe Ornati, Castelli won over a dozen prizes before passing away in 2003 at the age of 91. He worked in his native Ascoli Piceno, making over 200 violins, 70 violas, and 30 cellos. His workmanship is of the highest quality. 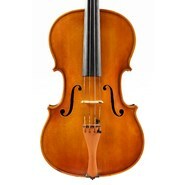 This viola has a strong, rich tone and is very responsive. Esteemed Chicago maker William Whedbee studied with Morassi and Conia at the violin making school in Cremona and worked at the William Harris Lee shop from 1979 until 1992 when he opened his own workshop. His instruments are used by professional musicians all over the world. Alf's reputation was enshrined as early as 1982 when the VSA declared him "Hors Concours", its highest award for craftsmanship. Since then his renown has grown. Alf's instruments are actively used in many of the major American orchestras, including the San Francisco Symphony, New York Met, and Chicago Symphony, and in major European orchestras, including the London Symphony Orchestra and Berlin Philharmonic. This viola, made in the same year he was awarded "Hors Concours", is remarkably easy to play, and has a clear, resonant tone. Cison trained as a violin maker in his native Poland, before accepting an invitation from William Harris Lee in Chicago. He has worked there ever since. Cison is especially noted for his violas. And has become one of the most respected makers from this well known workshop. One of the most successful workshops in France, J.T.L., as it was known, produced instruments across the spectrum of quality. They were known for their consistent quality, even as apprentices from all over Europe came to study with the firm. They won countless awards and prizes; in 1877 Thibouville was granted the Chevalier of the Legion of Honour, the highest award in France. 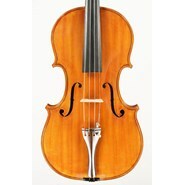 This viola was part of their high-end production. Though small in size, the tone is big and sonorous, rich in color. Carlos Funes Vitanza is a well known maker in San Francisco. He did his training at the violin making school in Cremona, Italy and has worked in the SF Bay Area ever since. 16 3/8" Carlos Funes Vitanza is a well known maker in San Francisco. He did his training at the violin making school in Cremona, Italy and has worked in the SF Bay Area ever since. After studying in Cremona for several years, Clifford settled in Philadelphia. Although he suffered from a rare neuromuscular disorder, he crafted over 60 violas, all of a high caliber. Among his customers were members of the Julliard String Quartet and the Philadelphia Orchestra. 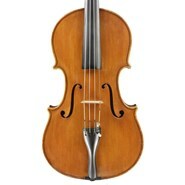 This viola is a superb example of his work, with characteristic plain wood and a rich, dark tone. Shahram & Saeid Rezvani 16"
Over the last 25 years the brothers Rezvani have made more than 500 violins, violas, and cellos. They began their studies in Iran with Ibrahim Ghambari Mehr, ex-student of the Parisian master, Etienne Vatelot, and later in Vienna with Johann Rombach. They continue perfecting their art as members of the Violin Society of America, working with such masters as Joseph Curtin. Now based in Los Angeles, they produce excellent instruments. Their work is very characteristic, resonant and sweet, easy to play, rich in tone color. We currently have 2 fine violas, both of which are quite responsive and represent a great value for the performing musician. Son and partner of Rene Aerts, Marcel distinguished himself at the early age of 20 by winning a prize at the prestigious "Concours de Sonorite" in Brussels, in 1930. His father, who was also his teacher, was the official luthier to the Brussels Conservatory, had established his own shop in 1921 and could count among his faithful customers legendary violinists such as Jacques Thibaud, Misha Elman, and Eugene Ysaye. He also made a quartet of instruments for the Pro Arte Quartet. Marcel grew up in this lush artistic environment, which had a profound impact on his work as a luthier. After moving to Los Angeles in 1932, he worked with his father for a time, before working for the Douglas Aircraft Company. He continued making instruments part-time and was highly regarded both as a restorer and a luthier. 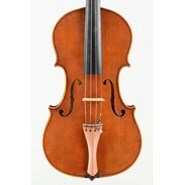 This viola is quite easy to play despite its large size, and has a fluid, rich viola sound. It is accompanied by a letter-certificate from the maker. Luigi Villa was born in Pesano in 1919. He attended art school and became a sculptor, working in wood. He also began to study violin making on his own while still young. For ten years Villa worked with Pierro Parravicini in Bovisio, one of the most important violin makers of the 20th century, thus continuing the tradition handed down to Parravicini by his teacher, Romeo Antoniazzi. For the rest of his career Luigi Villa operated a violin shop, doing repairs and restorations as well as making fine new instruments. 16 1/8".We have been offering the Delfour instruments for many years with great success. 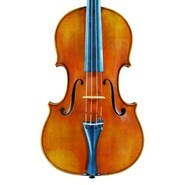 This beautiful viola has a clear, warm tone. 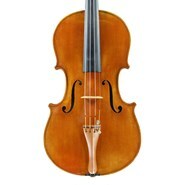 As one of the most important German makers of his time, Aschauer taught at the famous violin making school in Mittenwald. 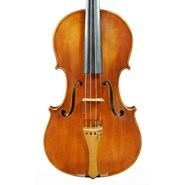 Born in 1905, Rosadoni concentrated on viola making. 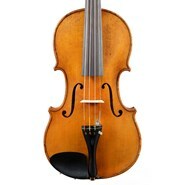 This nice viola represents an exceptional value in a well made Italian instrument.